Gah! I used to be the brilliant one at Verba Retorta University, but ever since that damned Professor Wordberg showed up, there's been nothing but trouble. And it's all his confounded machine's fault! The words I put into the machine were smallscale, nosier, apron, and outputs. The words in the bin appear to be jerseys, tangible, pulse, newsletter, inputs, antonym, unpins, mustard, afford, and factory. 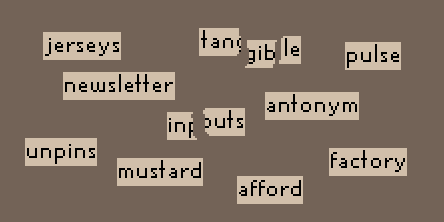 Which words from the bin are the, now transformed, words that I loaded in? If either of the two broken words are not mine, what word can I put through the machine again to create an unbroken copy? Looks like this very cool machine has a bunch of components wonderfully hinted at in the illustration. split into two parts with one part following the left path and one following the right path. There is some ambiguity in which half goes to which path. is an antonym machine, represented by the full change in color from a dark red to a light red. The antonym is then stored at the bottom of the left path until the word on the right path is complete. When the final right-side product is ready, the left-side antonym is flipped and stamped in the middle. has four components. The first component (light blue) rotates a single letter. The second component—the green box with pistons—picks up one letter and moves it elsewhere. The third component (red plus sign) increments the value of the first remaining letter by one. And the fourth component (the final blue-bracketed component before it drops the word into the bin) stretches the remaining letters out to allow the antonym stamping in the middle. smallscale is split into "small" and "scale"
The "small" goes down the left path and is converted to "big". The "scale" goes down the right path and the "c" is rotated 90° to become an "n", leaving "snale". One letter of "snale" is moved to a new position, leaving "sanle". The "s" is incremented to become "t", leaving "tanle". "tanle" is stretched to "tan---le" and big is reverse-stamped into it to make tangible. nosier is split into "no" and "sier"
The "no" goes down the left path and is converted to "yes". The "sier" goes down the right path where the "s" is rotated 180°, leaving "sier". The "s" from "sier" is moved to the end, leaving "iers". The "i" is incremented to "j" leaving "jers". "jers" is stretched to "jer---s" and yes is reverse-stamped into it to make jerseys. apron is split into "apr" and "on"
The "on" goes down the left path and is converted to "off". The "apr" goes down the right path and the "p" is rotated 180° to become a "d" leaving "adr". One letter is moved from "adr" to give us "ard". The incrementing component malfunctions and no letters are incremented! As Guntram Blohm pointed out, this can be seen in the animation during the "apron" sequence. "ard" is stretched to "a---rd" and off is reverse-stamped into it to make afford. outputs is split into "out" and "puts"
The "out" goes down the left path and is converted to "in". The "puts" goes down the right path and the "u" is rotated 180° to become an "n", leaving "pnts". The "t" from "pnts" is moved leaving "tpns". The "t" is incremented to become "u", giving us "upns". "upns" is stretched to "u-p-ns" and in is reverse-stamped into the blank spaces to make unpins. "shutdown" will be split into "shut" and "down" The "down" goes down the left path and is converted to "up". The "shut" goes down the right path and the "u" is rotated to become an "n", leaving "shnt". The "s" from "shnt" is moved leaving "hnts". The "h" is incremented to become "i", giving us "ints". "ints" is stretched to "in--ts" and up is reverse-stamped into it to make inputs. All this leads me to conclude that when Alconja gets around to making a word machine, it'll far outperform Professor Wordberg's and restore Alconja's place in the Verba Retorta hierarchy! Not the answer you're looking for? Browse other questions tagged word visual or ask your own question.